Few works of the early Church are as interesting to the modern reader or as important to the historian as Origen's reply to the attack on Christianity made by the pagan Celsus. The Contra Celsum is the culmination of the great apologetic movement of the second and third centuries AD, and is for the Greek Church what St Augustine's City of God is for Western Christendom. It is also one of the chief monuments of the coming together of ancient Greek culture and the new faith of the expanding Christian society. Thus Origen's work is of interest not only to the historian and theologian, but also to the hellenist. 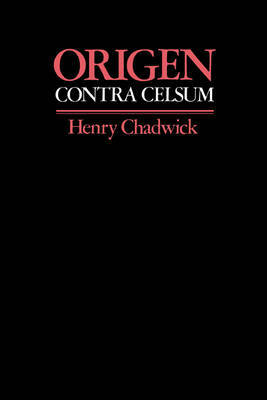 Professor Chadwick's English translation is preceded by a substantial introduction which includes discussion on Celsus' date, identity and theological outlook, as well as an account of Origen's philosophical background and method. The notes elucidate the many obscure allusions of a difficult text.